Little Toby once saw a tall mountain in the far east. 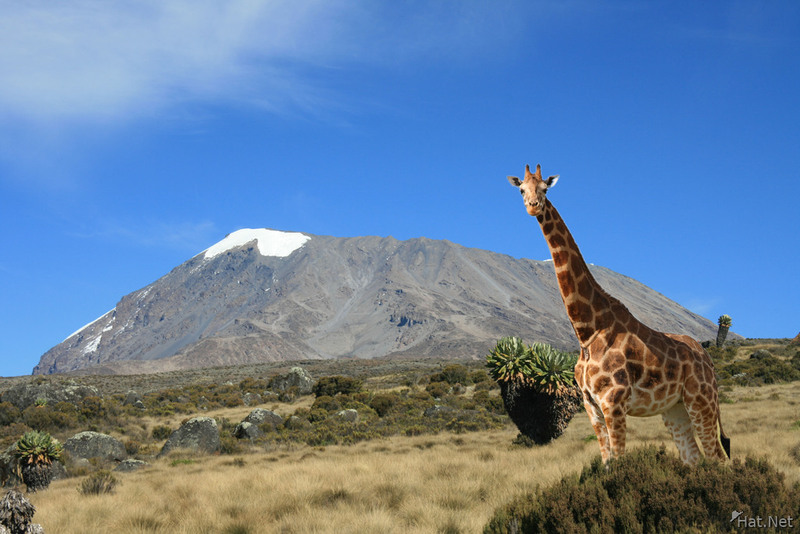 His mom told him it was Mount Kilimanjaro, the tallest mountain in Africa. He told himself, "I will dedicate my life to climb to the top of Kilimanjaro." He did lots of exercise. He ate lots of green healthy leaves from the acacia trees. Ten years later, he grew up to be the strongest masai giraffe in Serengeti. One day he told his friends about his ambition, but they laughed at him, "didn't your mom tell you that [[giraffes can't climb]]?" Poor Toby was shocked, all his goal of survival, aspiration of living and meaning of life collapsed on him like a five hundred tons hippo. He was thinking of hanging himself on a acacia tree. Fate saved his life--at least for a while--when Toby met the most beautiful giraffe before his suicide attempt. 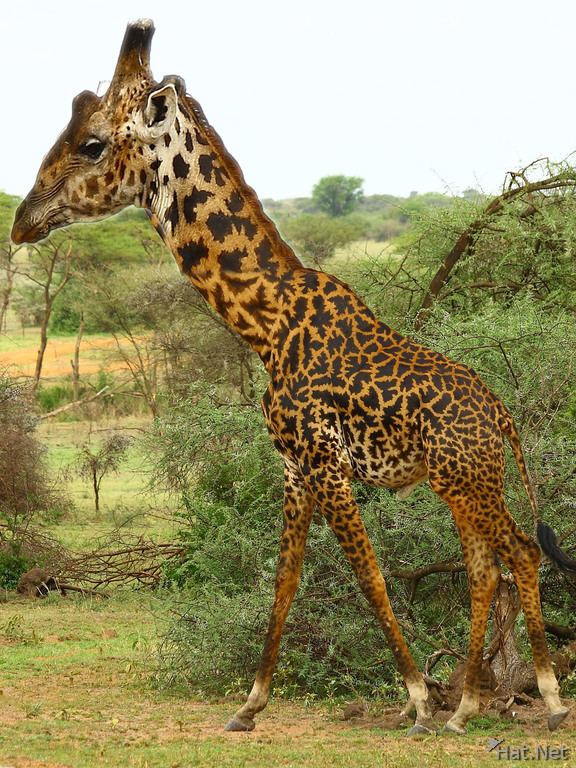 She was Kimberly, a beautiful masai giraffe with long slender neck, and light coffee colored spots (which for a giraffe means she was young). Suddenly an irresistible urge emerged from a mysteries part of his body, kind of like the gut feeling that urged him to climb Kilimanjaro, but maybe originated from somewhere a little lower. "I will dedicate my life to climb to the top of Kimberly," he thought to himself without knowing that he was thinking it aloud. Kimberly overheard this and looked extremely worried. That didn't discourage Toby. He had to do it, because a particular part of his body couldn't wait (no, not that part of the body!!!) The strong front legs that he had been training for Kilimanjaro had finally found their purpose! Unfortunately, Kimberly is not Kilimanjaro, where the later doesn't move, but the former can be challenging to climb when she was not in the right mood. So Toby failed on his first attempt. But he was not discouraged. His will... and organ was still as hard as a rock (as you can see from the picture on the left). He tried again, but failed again. To add insult to injury, he noticed a large group of tourists taking photos at him. He was under a lot of pressure, and found his personal privacy blatantly offended. Although his muscles were as hard as steel, but some other part of his body couldn't keep the hardness when he was being watched. Nevertheless, he gave another try. And yet he failed again. Kimberly was as cold as a frozen penguin. The tourists doubted his manhood. The baboons laughed at his failure. Even the hyraxes looked down on him. If his mother were present, she would have wished that she had had a hartebeest instead of a useless giraffe like him. Most giraffes would have quit now, but the word "quitter" was not in Toby's dictionary. In hindsight, perhaps he should have added that word to his dictionary, and then perhaps he would have been spared the tragedy that came afterwards. Every year, many tourists--as many as 8 to 9--were killed in climbing Kilimanjaro. So far, no one had died when climbing Kimberly--that is no one until Toby. As you know, the heart of a full grown giraffe weighs over 24 pounds and pumps 16 gallons a minute. 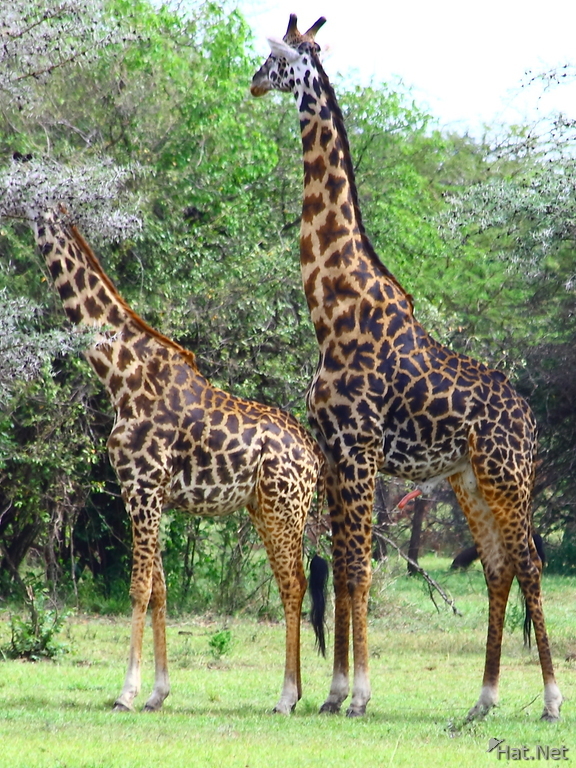 Because the giraffe's heart is much larger than his head, it has a series of special one-way, back-flow preventer valves in the neck to regulate the flow of blood to the head. Sometimes those valves malfunction when the giraffe gets too excited. That is exactly what happened to Toby. His head swollen to the size of a buffalo (as you can see from the next picture)... and then -- in the most spectacular way -- exploded like the fireworks on national holidays around the world. The moral of the story is: Sometimes pursuing your ambition is safer than pursing your temptation. To prove the veracity of this story and photos, you can click on the pictures below to see the exact location with satellite images. Can you see the little red bamboo between his legs?